The primary use for Holos Quad and Holos Titan is the generation of electricity and process heat to augment or replace power plants. Holos generators can be deployed at general power grid nodes and/or in areas where other nuclear and non-nuclear electricity producing technologies are not cost-effective (e.g. requiring fuel supply and/or transmission lines uprating infrastructures). 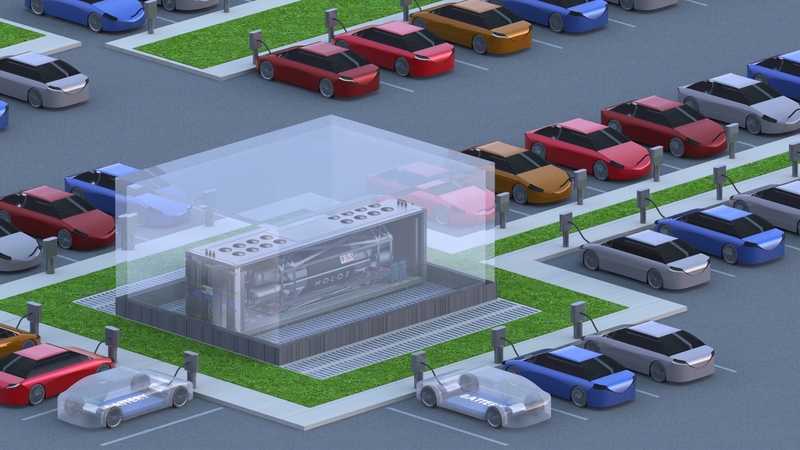 As the Holos generators can be clustered to meet local energy demand, they can be distributed and transitioned into the energy infrastructure to provide reserve power and support grid stability. The generators produce clean conditioned three-phase electric power with characteristics that automatically interface with substation and switchyard equipment. When multiple generators are clustered, passive air cooling requires a minimum distance between Holos units (shown without external shields in these representations). Inherent high-resolution near real-time load following capabilities are provided for all configurations of the Holos generators as their power conversion system is rapidly actuated (turbo-jet engine characteristics) with thermal power regulations executed by the Active Module Positioning System (AMPS). 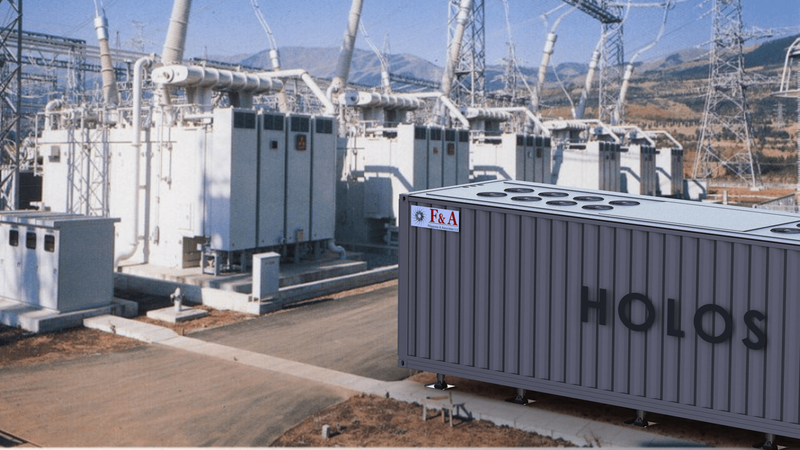 In case of substation tripping or substation equipment sympathetic-tripping, Holos can provide charging power to the substation auxiliary DC Control Power System even with Holos submodules in shutdown configuration (ORC decay heat conversion feature). Equipping power grid substations with Holos generators ensures emergency functioning of fault detection devices, as well as breakers, local and remote monitoring equipment. 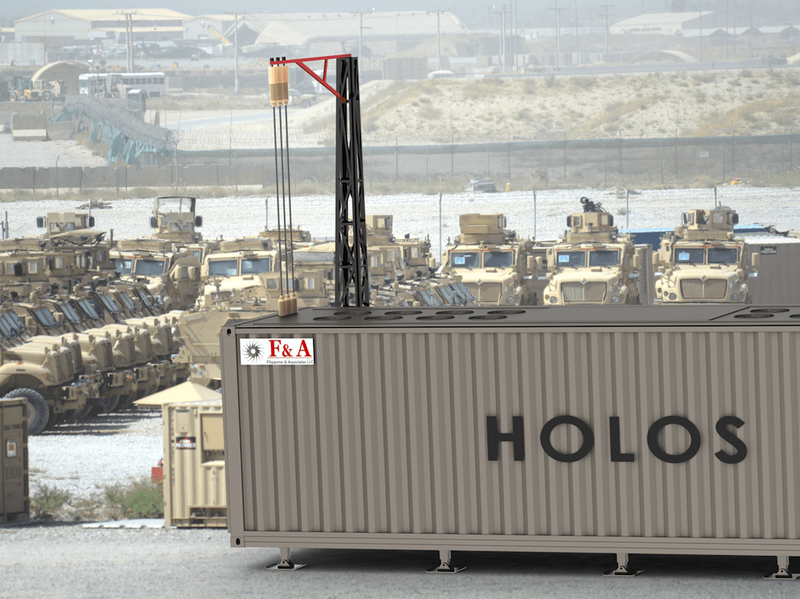 During normal load-following operations Holos can augment local power capabilities. Depending on substation equipment, Holos generators can be configured to supply power to the power grid and support mitigation of voltage reduction, load-induced perturbations, voltage collapse, and reduction of transformer regulation to compensate during load restoration processes. Utilities with a number of nuclear power plants could utilize Holos generators to execute emergency power supply functions as well as load following operations while varying the electric load on base-load large power plants at rates that are safer for these large systems. Utilities with multiple sites owning a small-fleet of Holos generators could rapidly deploy Holos generators to sites at risk and/or during the development of accident scenarios to provide an uninterruptable source of electric power. A consortium of utilities could invest in Holos generators and timely move them where needed. For example, Japanese utilities owning multiple power plants in high seismic sites could prevent future earthquake-tsunami induced Station Black Out (SBO) at their stations by timely deploying Holos generators in the hours following these extreme events. The ability to timely supply AC power to cooling pumps and vital/emergency power to control reactor and spent fuel pool cooling systems ensures cooling under Beyond Design Basis Accident scenarios as those manifested at the Fukushima Daiichi power station. How many homes can one Holos Generator supply? Holos generators can cost-effectively replace fleets of aging nuclear and coal-fueled power plants. Additionally, the generators can augment or substitute emergency diesel generators that are vital to ensure safe operations of large water reactor fleets. Clustering Holos generators by the switchyard of operational power plants ensures access to emergency power while supporting load-following supply to the power grid. Holos generators clustering by the switchyard of decommissioned power plants supports energy intense decommissioning activities while selling/suppling power to the grid at minimum connection costs. 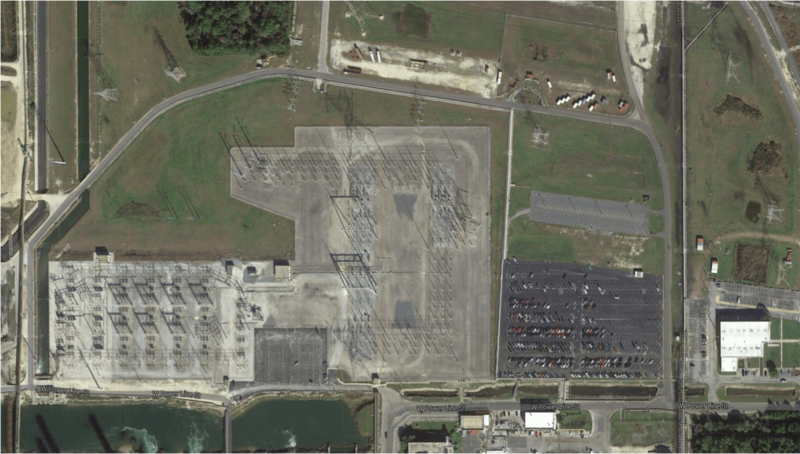 The aerial representation shown illustrates the switchyard at the Crystal River decommissioned nuclear power plant. This power plant produced 838 MWe (2,435 MW-thermal). The Crystal River Energy Complex consists of approximately 4,700 acres with the nuclear unit sharing the site with 4 fossil-fueled electric generators. In this example, 10x Holos Quad Titan generators could provide the electric power capability provided by the now under decommissioning power plant, at an estimated cost of $2.36B with Payback Period of 2.92 years by selling electricity at $0.1046/kWh. These estimates are based on the 2018 EIA’s average price of electricity in the United States (U.S. Energy Information Administration, 2018). As Holos generators provide near real-time load-following power production, they can be coupled to renewable energy sources (e.g. wind, solar) and compensate for the power production intermittence typical of these systems. Coupling Holos generators to renewable energy sources induces a variety of economic benefits and enables further expansion of renewable energy generators. Holos high-resolution near real-time load following capabilities ensure that, under normal operating conditions, a control area is able to balance electric generation and load. Regulation is intended as the use of on-line generation, storage, or load that is equipped with Automatic Generation Control (AGC) features, and that can rapidly change the generated MegaWatt per minute (MW/min) to track fluctuations in customer loads, and to correct for the unintended fluctuations in generation. Regulation helps to maintain interconnection frequency and manage differences between actual and scheduled power flows between control areas. Regulation also actively matches generation to load within the control area. Ancillary services are defined as functions performed by the equipment and people that generate, control, and transmit electricity in support of the basic services of generating capacity, energy supply, and power delivery. According to the Federal Energy Regulatory Commission (FERC), ancillary services are intended as those “necessary to support the transmission of electric power from seller to purchaser given the obligations of control areas and transmitting utilities within those control areas to maintain reliable operations of the interconnected transmission system.” Hourly markets for regulation and the contingency reserve in most independent control areas, are advantageous proportionally to a resource ability to supply these services near real-time to satisfy the dynamic nature of the hourly energy market. 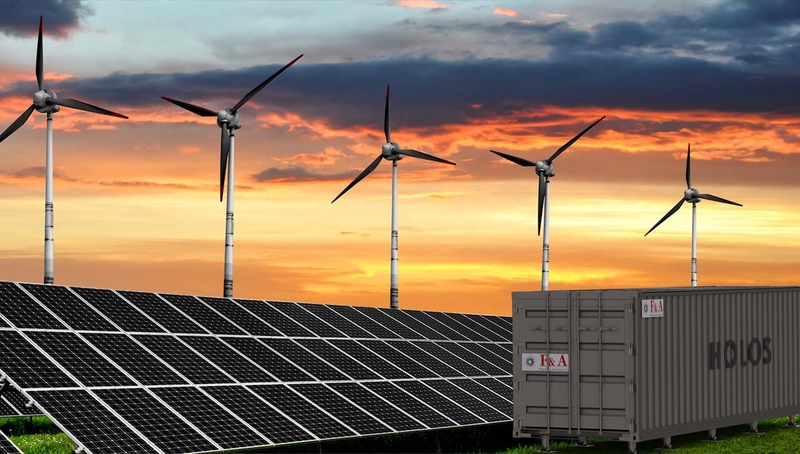 As Holos electric power rating can adapt to the hourly market variability near real-time (high-resolution load following feature), the generator can support services, command higher prices and provide distributed contingency power for generators based on renewable energy sources. For example, wind generators produce fluctuating electricity as a result of wind conditions. To ensure grid stability, other generation resources have to be employed as wind-based power output variability is directly proportional to wind speed changes. From a grid operation stand point, the adoption of distributed Holos generators inherently equipped with AGC capability and supplying MW/min proportionally to grid operator needs, no longer requires the inclusion of non-renewable energy based generators (e.g. fossil-fueled and large base load nuclear power plants) as part of the generator portfolio in a given area to ensure grid stability. 25% of a single 13 MWe Holos Quad generator can provide enough electricity to power a fleet of 1,000 Electric Vehicles (EVs) for 12-20 years (depending on fuel cartridges enrichment and duty cycle or power demand). This estimate is based on the duty cycle representing taxicab operations with 70,000 miles driven per year. The Holos generator could be installed at undisclosed locations with power distributed (e.g. underground) to supply multiple EVs charging stations. The remaining Holos generator’s load-following capacity can be used to support grid stability and off-loading of grid substations and power transformers. Holos generators can be deployed ready to produce power at remote sites. Referencing electric power requirements for mines operated in Ontario, Canada, as examples, the averaged power demand for these applications may vary from 10 MWe to 20 MWe for a lifetime of 15-25 years, and use multiple diesel generators to meet this demand. The estimated cost of using diesel generation for remote mines located in these areas can reach and exceed 34.5¢/kWh. Costs for diesel electric power generation at these remote locations increases proportionally to the difficulty in transporting fuel for the generators. Holos Quad generators operated under similar conditions would produce electricity at 5.19¢/kWh. 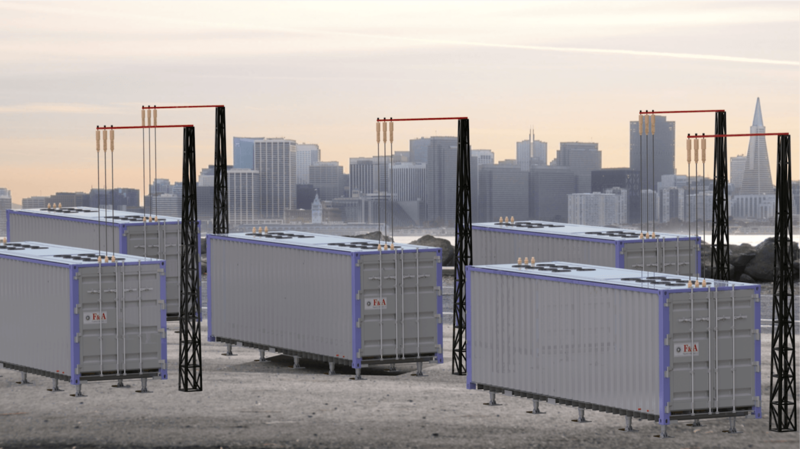 Holos Quad can provide a cost-effective alternative to continued use of diesel generators in remote locations where there is little or no access to an established electrical grid and diesel fuel logistics and storage impose substantial economic challenges. The Forward Operating Base of Bagram Airfield in Afghanistan represents a power demand of 56 MWe and uses several diesel generators to meet this power demand. Using this military base as an example, at an averaged $7/gallon, the annual fuel cost reaches $256M and requires support for 286 annual refueling convoys. 5x Holos Quad generators can supply up to 65MWe without refueling for 12-20 years, therefore meet and exceed Bagram Airfield’s energy demand. Replacing diesel generators for these applications reduces casualties associated with escorting refueling convoys and induces substantial cost savings. Special configurations of Holos generators can be airlifted for timely deployment in areas hit by environmental extremes or areas subjected to Design Basis Threats (DBTs) that can result in damaged electric power infrastructure. This configuration of the Holos generator can provide electricity and process heat autonomously and for a prolonged amount of time. 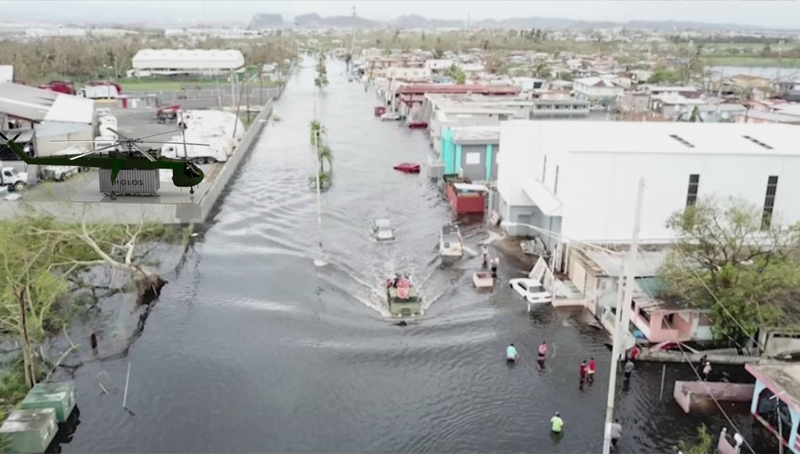 The representation shown illustrates Puerto Rico infrastructure destruction due to environmental extremes in 2017. As a result, the bulk power grid is down with the supermajority of hospitals, waste water treatment and potable water facilities inoperable. The estimated time to restore electricity to the majority of the island is 4-6 months. Holos Quad generators configured to support emergency power applications can be rapidly deployed at undamaged power distribution locations or at locations dedicated to support emergency power sources. Holos generators can operate as electric-islands to supply makeshift local grids. Multiple generators can also be clustered to supply power to emergency and fire protection responders facilities, law-enforcement and water pumping stations, water purification plants, sewer pumping stations, critical healthcare and government facilities. In addition to supporting emergency response in areas where power grid and infrastructures have been severely damaged, Holos Quad generators can provide electric power to restore power grid stability and mitigate otherwise unavoidable sympathetic tripping of base-load grid generators. Holos-generated electricity can substantially reduce operating costs for marine electric propulsion applications. Modern marine vessels retrofitted with electric propulsion operate with fossil fuel-generated electricity (e.g. diesel generators). Marine Diesel Oil (MDO) is the largest operating cost for containership operators, making up approximately 50% of annual operating expenses. A typical Neo Panamax (NPX) cargo ship capable of carrying 12,000 twenty foot equivalent units (TEUs) requires approximately 74MWe for propulsion and ancillary systems. Combining Holos generators with electric-drive propulsion can modernize or renew obsolete fleets by retrofitting ships with submerged electric motor-propeller systems or “propulsor pods”. High-performance Integrated Electric Propulsion (IEP) is implemented on board of modern commercial and military vessels as, for example, the USS Zumwalt (DDG 1000). In this application, a total power rating of 80MWe is required to satisfy current speed and weapons requirements, and to support potential expansion to drive directed energy/laser and electro-magnetic railgun weapons. A single Holos Titan generator can support the power requirements of the USS Zumwalt with lower real-estate/foot-print represented by currently utilized turbine- and diesel-engines when considered all together with their unavoidable fuel tanks. For these applications, Holos generator retrofitting would consist of coupling the integrated ship power management system with Holos power bus, and thermally couple Holos passive heat transfer surfaces to the ship structure (surrounded by air and water). 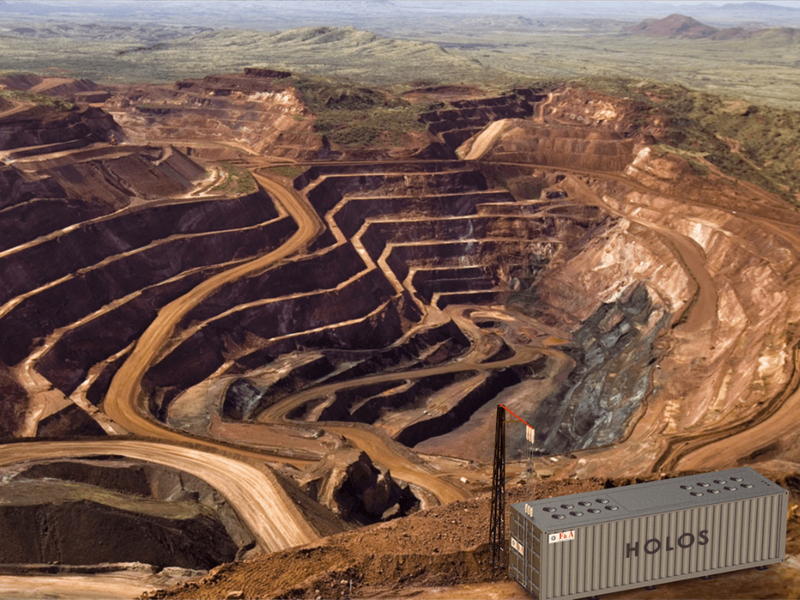 Holos Titan can be installed on board of container ships by dedicating a relatively small portion of the cargo bay to house the Holos generator normally comprised within standard transport ISO containers. Container ships’ cargo real-estate is generally configured to accommodate containers below and above the main deck, thus Holos can leverage the container ship existing infrastructure. A 12,000 TEU Neo Panamax cargo vessel could incur fuel expenses of over $1.6B during a 20-year operating period. Fuel estimates are calculated using the Average Global Bunker Price for MDO as of the end of 2016 and calculating future costs based on 80% time at sea. A single Holos Titan generator can be retrofitted on NPX containerships with electric propulsion capabilities to supply up to 81MWe of propulsion and ancillary power for a 20-year investment cost of $219M. By removing Holos fuel cartridges and replacing them with intermediate heat exchangers, Holos integral power conversion components can produce power by thermal coupling them with an external heat source (e.g. nuclear core) “packaged” by a 3rd party. In the simplified example illustrated, a core developed for very small modular reactor applications can be thermally coupled to Holos power conversion module without BoP. Under this configuration, the thermal energy produced by the nuclear core is transferred to Holos integral power conversion components which also execute passive core decay heat removal functions. As a result, 3rd parties specialized in fuel and core manufacturing can deploy sealed cores and readily thermally couple them to Holos integral power conversion system.